Ben Chappell may have to take it to the air even more the rest of the season. If the Indiana quarterback doesn’t put the offense on his back, the Hoosiers may struggle to score points during Big Ten play. That’s because starting running back Darius Willis will miss the rest of the season with a patellar tendon injury. The 6-foot, 225-pounder will undergo surgery Oct. 20 and is expected to make a full recovery. The sophomore led the Hoosiers with 278 rushing yards and four touchdowns on 64 carries. He added 11 receptions for 102 yards and a score. 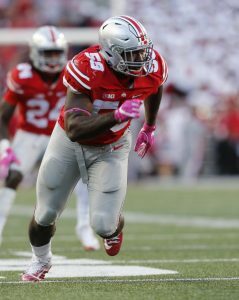 Willis, who missed last week’s game at Ohio State with a groin injury, has battled ankle injuries throughout his career and also had been nursing a nagging knee issue.